Narayana's Overflowing Vessel: Our Lacs Literature: Lacking No More! Our Lacs Literature: Lacking No More! 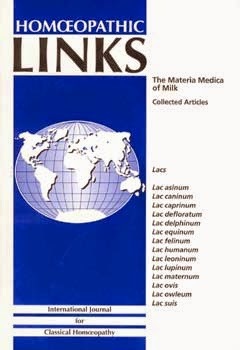 ﻿﻿Book #1) One of the first Homeopathy books I ever owned was the great collection of Milks from Homeopathic Links (The Materia Medica of Milk: Collected Articles). It brought the Family of Lacs into our awareness. With its' superb Introduction covering the group's Themes thru to information on the individual substances/rxs & their symptoms it was simply brilliant (13 rxs from Lac asinum to Lac suis with Lac humanum sitting appropriately in the middle). It was well worth what I thought to be a hefty price during my "student days". Just like breastfeeding, how can any Homeopath argue that Lacs are not a natural grouping. Most certainly a classification we have benefited from...or, should I say, been nourished by. Some practitioners resist prescribing based on Families, but, nonetheless, will group remedies according to some form of classification: we are all familiar with pathology based groupings. Longstanding ones or chronic ones, dare I say, that come to mind are "The Grief Remedies", "The Insane Remedies", the Headache or Diarrhea Remedies, not to forget the Malarial Remedies or Whooping Cough Remedies, etc. Our old time masters and, of course, Hahnemann were doing this. Naturally the Miasmatic rxs can be seen as pathologically based but as you know, Hahnemann himself did not only mean to classify a rx per dx but also as a way to clear ancestral Miasmatic imprints that were more about susceptibility as far as energetic resonance - even from one's cultural/geographical perspective as has been discussed of late (another posting my friends). All in all, since early times in our history, Themes of remedies were observed. As early as Kent the Essence of remedy pictures were being captured as a predecessor to modern Family Classification - of the variety I am speaking about when I talk about the Themes of the Milks for instance. 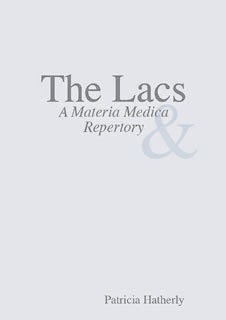 Kees Dam's Introduction in the Materia Medica of Milk is still worth referencing to this day as it set the bedrock from which we can add to our knowledge of the Lacs: "I have attempted to give a format that can serve as a start for anyone who wants to elaborate, expand and deepen it more." (p. 22) A great way to bring a resource and a Family into the fold. The Lacs definitely have their Themes with individual remedies of the Family falling under various groupings. A prime example of this is found in Louis Klein's Clinical Focus Guide. For Lac delphinum he has the rx as part of the following "Homeopathic Groups & Miasms: Soft-sided Group, Milk Group, Cancer Group, Rabies Miasm". (p. 151) This rx is a prime example of the many expressions in human form of a remedy's source...of course, there are so many, but the Lacs certainly do lend themselves to this. Personal Aside for Your Information: It takes one to know one - I am a Lac rx and when I behave and think in a way that relates to source it's almost funny, I have to say...now that I can have a sense of humour about my rx, which was not easy initially...likely because I am finally moving out of the state, at last!! It is not a pretty picture to be a Lac, let me tell you! Further to this, we can also look at Families, for example, within the context of the Source. Homeopathic Families can be from a Botanical Family: The groundwork of both Scholten and Yakir's work that we are now able to benefit from with their Plant Systems that are based on Botanical Classification. Substances with common elements/composition can be grouped together, with Lacs or Acids being obvious examples of this. Thus, Lacs can be grouped via their similar constituent parts/chemicals never mind their Themes as per Mental/Emotional and their Physicals (And Phys as you may know can very well express under Themes that tie them to the Mental sphere of the state). Book #2) So, if we were to put Family groupings on a Classification Continuum of sorts we would have the Pathology based remedies at one end and on the other end we would have something like what Massimo Mangialavori does in his work: remedies of different sources grouped under headings such as "Destruction/Self-Destruction". See here as example: (http://www.narayana-publishers.com/Self-Destructiveness-The-Acids-and-Similars-in-Homeopathic-Medicine/Massimo-Mangialavori/b2547). Under this heading you find not only Acids but Spiders, Solanaceae and many other sources of remedies that have the Theme of Destruction. Just to be clear, he points out that we Humans by nature are destructive, but, as is the case in Homeopathy when a Theme of Destruction (or whatever other Theme/element that can be named as a Rubric for example) is found in a case or in a remedy it has to be really a big deal or predominant – albeit it can be subtle but running almost as an unseen undercurrent in the case, as with the Acids. So, maybe we see Destructiveness at the onset of illness in a subtle way and as well on mental plane in less obvious way then we would with, say a Snake (mind you some Snakes have destruction in subtle ways too (it all depends, as we say!) – but outward Destruction is a little different than what the Acids are about – they burn thru things and harm themselves along the way even more than Snakes). I should mention here that Kees Dam points out that Rajan Sankaran has the Lac element as being the "basic feeling" for a patient in his way of viewing Lacs as a Family and that the "compulsion" is the Mammal aspect of the rx/state (this is captured as well by Massimo's heading). You feel that your identity is not strong and so you act to individualize yourself, the story of my life folks, lol! Sankaran's reference is in Spirit of Homeopathy...and on p. 9 of M.M. of Milk. The Family of Lacs is an obvious grouping and now with all the great literature available to us it would be a total shame if we are not prescribing from the full range of available and potential Milks. I simply can't fathom that there are practitioners that think only to use just what was available in Hahnemann's time – Lac caninum as an example of a rx that gets overly prescribed from what I sense (note - it was a Rottweiler that sourced the milk). As early as 1905, James Tyler Kent stated in his lectures on Lac caninum: "All the milks should be potencized, they are our most excellent remedies, they are animal products and foods from early animal life and therefore correspond to the beginning of our innermost physical nature. If we had full provings of monkey's, cow's, mare's and human milk they would be of great value." (Lectures on Materia Medica). Book #3) Jane Cicchetti in her lovely book Dreams, Symbols, and Homeopathy has a whole chapter on "Milk Symbolism" and it is here you can get a good sense of the potential that Kent saw for the Lacs. She shares with us that in his time there were Lac caninum, Lac felinum and Lac vaccinum (cow's milk) as proven by Samuel Swan, MD. He also did provings of individual constituents of cow's milk, including Lac defloratum. See pp's: 169-78 for info on this. At the start of my studies in Homeopathy I missed the earlier Links journal issues with lots of Lac cases – the historic Lac maternum work of Tinus Smits, for instance...when he first introduced this remedy to the international Homeopathic community (5/99, Volume 12, Millennium issue of Homeopathic Links). I started my subscription in 2004 and there was always mention of the Lacs but interestingly I did not see the rxs as belonging to a Family. We most often learn from our cases and since I had no Milks in my caseload (or did I?) I didn't take much notice of the literature (until I got my Milks book that is and actually still somehow only viewed theorectically). As mentioned already I am a Lac rx, but early on in my career I was not given this rx, so I think I can be forgiven my Lac(k) of awareness and interest in the Lacs... but for a while now many of my patients have done well on Lacs when called for - now it doesn't surprise me that at any given time a Lac will be needed by someone that we are seeing in our practice. Nowadays newbies on the scene can take the Lacs for granted, getting exposure to a very nice array of books that have since been published, complimenting the Links Milks beautifully. Since there will be a Lac coming your way any day now, ha ha, I will continue with my overview of the Lacs Literature and what information I know to be available to date. 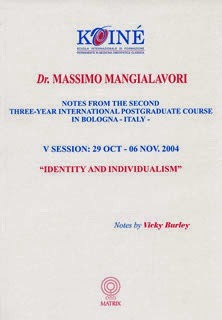 Already, you have the Mangialavori info...which incidently was not exactly a book but part of the Session Notes from his 3 year International Post-Graduate Course (read, advanced course, as in the HMC of Klein that we have on our shores - they both do Webinars, so now, hey, you don't have to travel...mind you Italy would be grand! I can't complain cause this summer I go to Klein for advanced learning, he holds a retreat on an Island...Bowen Island, B.C. - I can hardly wait, my first time and so feel I now have Arrived!). Note - Massimo's MM and his Theming work were part of MacRep and was available to Homeopaths with that software early on. 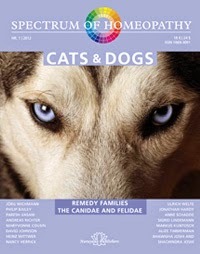 Book #4) The journal Spectrum of Homeopathy did a great issue on Lacs called Cats and Dogs. This was issue number 1 of 2012. Here we get a view from the pinnacle of what Homeopathy can offer by way of prescribing the Lacs: simply outstanding, as are all things Spectrum. Half of the issue is devoted to the Canidae Family remedies – with Husky and Coyote cases by David Johnson of the US thru to Lac caninum (Alsatian) or German Shepherd by Heinz Wittwer of Switzerland. All are presented so as to give a well rounded picture of the Lac-c related remedies. there is a wild case, so to speak, of Alize Timmerman of the Netherland's whereby she treats a couple that are 2 very different Lacs (Caninum and Leolinum!). You can see commonalities or Themes, but, more to the point, what was clearly illustrated for me was that the correct Lac must be given and that if one sticks with only a few Lacs in their prescriptions it will not be helpful in anyway for our patients. Been there, done that...in my cases for instance where I over or misused Lac-maternum in lieu of the exact milk of another mammal, as in Lac-leoninum or lupinum. Mind you, it was not totally for naught because in one case when I "opened with" Lac-m it brought out the true state of a boy that was there all along but quite hard to pin point...as is the case with Lac-lupinum. This is mentioned specifically about this rx in a book I will tell you about later...Lac Remedies in Practice (why oh why, did I not see that his dream of putting on a wolf's head for "Show- and-Tell" in his Kindergarten was not an indication of him resonating as a wolf, lol). Book #5) I'll mention here that my other source of info on the Lacs early on was what I got from Louis Klein in his HMC course that I finished Spring of 2012. He has great cases and off the top of my head I can recall (and visualize from the videocases) the Lac-caprinum patient – a fabulous case whereby the sexual aspect of not just the goat itself but the lonely goat herder was captured in this man, fascinating, and a nice curative rx for him (as clearly no other Lac rx would have been). As with all of Klein's material he Themes it right away and beautifully, with the Lacs being no exception. 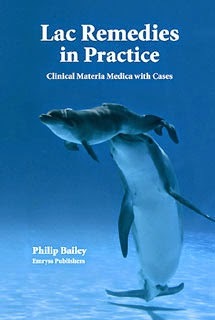 Something to keep in mind with the Lacs from his practice and what I can now confirm: with patients needing a Lac, you see the Animal but in a muted form: washed, as if with milk. As an example of this: my Lac-delphinium case stopped competitive sports due to being too aggressive when playing sports. This was in order not to injure others on her own team but especially the opposing side. This is a great example of the human expression of this source...those noses are hard on dolphins (and even sharks can be dissuaded from attacking dolphins when a pod of them put their "noses to the grindstone", ha ha). The patient's sport was hockey and as some of you may know, you can really get hurt and hurt others in this sport, especially when it is played Canadian style. As well, from Klein, his take on this Lac in particular is that there are Family Secrets - this is somethg unique to Klein about Lac - delphinum/what he has seen in his practice...it is in fact what lead me to the rx (okay, my Clinical Supervisor lead me to the rx based on Klein's work...I shall not lie - which I would never tell a lie, even though I am a competitive animal, but since I am a Lac I likely wouldn't as much as one which has a venom for instance, ha ha). As far as reading material, you do not get much better than the Herrick book. She really set the stage for source info laid out beautifully as well as Theming with the Provers words/info captured in such a beautiful/artful way...poetry in motion...and practical for us as well. If you have not read this book, get your hands on it - it is equal to the Milks MM but admittedly it would be a luxury if it was a toss up between the Links Milks book or this one...but, if money is no object both are essential...one is the Science and the latter, Herrick's, is the Art with a definite and strong cross over. The two make a perfect starter kit on the Lacs for Homeopath's of all stripes. Books #7) & #8) At this point I would be totally amiss not to bring into the conversation Patricia Hatherly...adding to our ever growing list of books. Of everyone associated with Lacs, I think of Hatherly as the "Mother of the Milks"...especially Lac- maternum, Colostrum and Lac-humanum. I had access to her first book, albeit borrowed from a colleague and not read cover to cover, (was at the same time that I read Melissa Assilem's Matridonal Remedies, which incidentally I would say is another book for the List - see my earlier posting on this book, which I have not numbered or placed on the Lacs list, but could very well as it's a necessity just as Tinus Smits work on Lac-m and Lac-h, see also my posting on his work...specifically the "Universal Layers"). Patricia Hatherly is a one-woman-show as far as Milks, Breast Feeding, and the connection between the two! This was true with her first published book and is just as true today with her second book, The Lacs: A Materia Medica & Repertory (2010). As far as I am concerned she is part and parcel of the Theme of this Family! It expands on her earlier published book called The Homoeopathic Physician's Guide to Lactation which came out in 2004. A thorough work that covers lactation issues so as to prescribe for mother and baby to help with problems that arise for either with breastfeeding. Patricia Hatherly is a Lactation Consultant and Homeopath in Australia. In 2002 she did the proving of Lac-m and in this book she does a DD of Lac-m and Lac-h and also looks in detail at Lac-c. Her first book covers the constituents that make up human milk and detailed info on the physiology of human lactation (covered as well in the MM/Rep). Her work relates to the concepts of Nurturance, Bonding and Attachment Theory that are all part and parcel of the Themes of the Lacs. The very core of what the Lacs are about starts here for us humans as was mentioned in Kees Dams work but really is brought home by Hatherly. Spelt out: Humans are Mammals that need to be brought back to the breast, as in needing the remedies of the Family of Lacs for ourselves/our patients because we have evolved to the point that we actually are no longer Securely Attached, i.e. 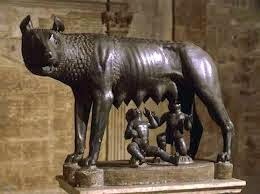 - not having been able to latch on as it were to our own mothers, and, thus, to our roots as Mammals...hence, Hatherly's tie in with breastfeeding and why we ought to get back to the basics of this as well as use Lac rxs to address states that we get into due to a breakdown in our natural ways. This essential "lack" can very well address the very Human problems we have despite the other Kingdoms that our patients may well belong to...and so, even if one is a Mineral or an Insect for that matter (and least we forget, a Plant) maybe at some point mammary gland remedies - just as with the Matridonal remedies - may be called for in the case/at some point in time. I now do have Hatherly back in my life - just this winter Patricia generously sent me a copy of her MM and I do love it just as others do. I will write a full review for a North American journal to highlight it for those that somehow are not aware of it. There are already 2 reviews pointing out how it is clinically useful. 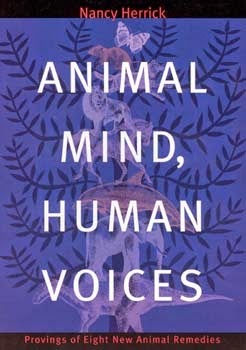 Roger van Zandvoort correctly calls it an "Opus" of a book...and he should know as he is a repertory man extraordinaire. So his naming it as such certainly does make the argument for having it on your shelves. Having said this, I will say that the prescribing of Milks from my experience is about having the right frame of mind to grasp that a Lac is needed either "Constitutionally" or as a matter of clearing a state that is somehow imprinted onto the patient and, therefore, it could be a matter of needing a Lac for the reasons as outlined in the Themes of the Family with a particular one being necessary to do the job...really, as with all remedies, the correct one at the right time is what it is all about! Aside: funny enough Kees Dams (I need to meet this man!) has this to say on what is the perfect Simillimum - interestingly it is in a piece he did on Lac-m in Interhomeopathy, February 2006 - "It must be given at the right time and in a form that can be dealt with." There are two other points and more great stuff in this piece that elaborate further on finding the Simillimum that really reinforce my sense that Lacs are actually underprescribed (that is the correct Lac for the patient needing a Lac if they do - recalling my sense that Lac-c is overprescribed, but in my opinion it is not actually being given as a Lac rx per se). Note - her site has great articles/cases and provings that you can read/get a sense of how intertwined her Lactation consulting work really ties in with Lac prescribing for states induced by the problems that can arise for women and infants at the time of birthing/breastfeeding, etc. Book #9) So, without further ado since you already have added this to your own Wish List, I will side step Australia from whence Hatherly and one other Lacs author hale from (coming up...)...to mention that Farokh Master has a book (actually power point slides from a lecture it would seem) that I would say needs a quick mention because we are after all doing an inventory of our Lacs Literature. It was made available to the Homeopathic world in 2010 and I had always scanned it along with my Klein notes when considering a Lac rx. Now, I have such a plethora of material I just whip thru them all like a card deck - got it, need it, want it - when thinking a Lac rx is warranted for a patient. 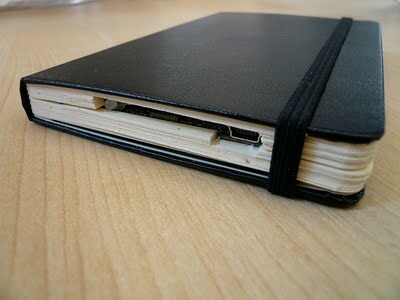 But the Master book is perfect in particular when needing to DD the Milks based on only Physicals...and not on doctrine of signatures and such, as in seeing clearly Animal traits put onto Humans (opposite of Anthropomorphism). A quick note on this here: it's not as obvious in most cases until you actually know what the rx is - until you do, all the words used and gestures do not make for an easy prescription...once they are on the rx though, let me tell you, they are literally speaking the source and it is crazy! You see it in subtle ways once you have come to the rx and you look back at the words of your patient. Anyways, back to Master's book: I find it very trustworthy as it has great info on the Physicals of the rxs as already mentioned...as he does par excellence in all his work from anything such as Snakes, Fungi to his top notch Pediatrics clinical guide of 75 remedies. He really rounds out the info that was lacking not too long ago - but, thankfully not so much these days. I am still grateful for the book because it was helpful in all my cases...the other books I had initially did not have enough on the Physicals...and as happens in our Literature on whatever topic each book has it's own special gems that can only be found in the one book and no other and so, you have to constantly be re-reading, borrowing, using your Reference Works or such and then doing it all over again when you next suspect a rx from a certain Family although you already prescribed from that group of rxs! There is a female patient that gets Lac-leoninum but for the life of me I can't seem to remember her as clearly the lone male Lion...I do recall it being a great case but I can not get a visual on her - hey, I could get the DVD and then it will come to me...fortunately, the last book I will tell you about has a great DD on Lac-leoinum and Lac-felinum that really informs beautifully on the version a woman needing Lac-leoinum is about...but, to finish with Jonathan Hardy, if we can get in print his data from his experience that would be great - hint, hint Narayana Publishers, cause I am seeing you have established him as an author with you and published his work on Spiders and Scorpians (I have that on my "Wish List" too, along with the DVD - this List of mine is getting a little out of hand I must say, there is such a flurry of publishing activity it makes for hard choices on the budget of a Homeopath!). Note- Bonus material: you get to see the Matridonal rxs come alive with the adapt use by Jonathan Hardy in 2 cases in the 2 hrs of footage. Until recently, there was little on their use other than from the Homeopath that brought their use to us, Assilem - and her perspective is one that you have to wrap your head around and get into the groove of her prescribing/her framework or overall context in order not to miss an opportunity to get your patient their needed Matridonal rx! I had, fortunately, my teacher, Louis Klein's cases - off the top of my head I believe it was Umbilicus humanus...always huge learning for me to see his video cases when I was in the HMC cause having a patient matched to the MM of the rx is always the best and Klein put his patients up and we dissected the case so that a way to recognize the rx in one's own practice was what it was about, love ya Lou! #11) So, we are at the last book at last...on what has proven to be a very extensive Literature List. I have saved the best for last (but in no way, would I say not to get at the very least 2 others of the above books if you are starting to build up your Lacs Library). This one really struck a cord with me, maybe my Umbilicus cord, ha ha. It could have been the timing on this - and I have to thank a local Homeopath, Nadia Bakir for mentioning it in a local discussion group on Face Book when someone else was asking about a case...that was maybe 1 year and a half ago right about now and I am still singing the praises of this well done book...which is, drum roll: Lac Remedies in Practice: Clinical Material Medica with Cases by Philip Bailey - our other Australian Milks Homeopath...what is in the water there anyways? This book like Hatherly's book came out in 2010 - okay, there definitely is something going on to have them both resonating with Lacs and getting their works out the same yr. Well, it matters not cause they are very different books and compliment each other nicely. So, what is it about this book that I like so much....hum, let me thinkie on this. Firstly, I would have to say, the Themes Bailey has of the Lacs have a different spin in many ways from others - but not out of orbit or anything, just a slight shift but enough that he expanded the horizon for me personally on Lacs and the possibilities they hold for patients in our modern world that is so very devoid of love, support, interconnectedness, etc that is helpful and kind...somehow with the cases he has Down Under one gets the distinct sense of alienation that people needing Lac rxs would feel - they are trying to survive (Animal quality/Kingdom) and yet are really not aware of this...sort of somehow stands out with Bailey, as no other Homeopath's Lac cases for me. So far, I am aware I have not said anything concrete, but that is the quality I had upon reading the 15 pages of the Introduction's Themes...it was as if you get a feel of the Themes more than just the words with Bailey: Missing Foundation, Ambivalence, Paradise Lost, Alone & Co-dependent, Where is the Man?, Victim Consciousness, and Push & Pull for instance are 7 of the 12 Themes....not including ones that are unique to each of the 8 rxs that Bailey has info/rubrics, cases for: from Lac humanum to Lac lupinum - this last one being very good info that somehow had me really appreciate his unique spin on the Lacs. For instance, the case had a feel that was so different from others I had...and with this book I was able to really see some of my cases with clarity where I had been lost with them prior to getting this book. I would whole heartedly recommend this book. 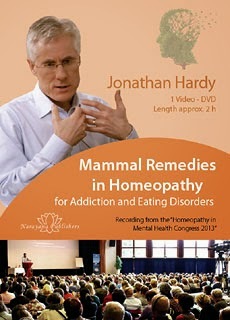 I have learned not to judge a book by its cover - this is a nice one mind you - but in terms of Bailey I had judged him by his author pic and ruled out this Lacs book as anything I would have been interested in because I believed his Homeopathic Psychology book was something that was very simple, my can I ever be judging! So, will have to check that one out one day....and always remember never to think just cause someone is good looking that they are not necessarily flakey, and boy, who am I to pronounce on flakiness!! So, Everyone! it has been fun to do this little exercise -- an inventory of our Lacs resources. I hope it will prove to be helpful for those of you trying like myself to always get the best value for your hard earned dollars. It is totally exciting times for us Homeopaths because we have so many quality books to chose from now and, therefore, so many more remedies we can match our patients to when they come to us for help...what really we all strive to do, heal those that cross our paths on their and our own journeys of healing.